I started off the new year without any resolutions. I think more than anything, I want to continue to simplify a lot of areas in my life. After my grandfather died in '07, I decided I needed to "let go" of things whether it be actual "stuff" or even just feelings about things I can't control. After Pappa died, we had to clean out his home for the estate sale. I knew that Mamma's sewing counter/cabinet would likely be tossed by the new home owner. I decided to bring it home with me to use for my scrap space. It was a true '70s style row of cabinets with a very '70s yellow countertop. I have to admit it was an eyesore, but it was Mamma's and I enjoyed doing my craft where for years she had done hers. After Christmas, I realized that the set up in my scrap area wasn't really working for me. I felt like my area was continually growing and taking up more of the bonus room and cutting into the available play space for the boys. Although everything started out with a space for storage, it wasn't set up in a way that made sense. I realized I was just making due with the space/drawers/cabinets I had. Shortly after bringing the cabinets home, I realized the counter wasn't a functional workspace and I added a table to form an "L". It worked. For a while. More importantly, I was able to put something meaningful to me to use during a time I couldn't part with it. After Christmas, I stumbled across a 50% off scrapbook storage sale at Michaels. I realized the money I'd been saving for my dream piece of storage furniture - and Expedit shelf from IKEA (for which the nearest store is hours away from me!) - could be put to better use with this customizable cube system. After much thought in the store imagining the perfect set up in my head, three trips to two different Michaels (I realized I could use more than I orginally purchased and then after reconfiguring it, I still needed just one more!) and a lot of hard work with some help from Blake and Kevin, my space now looks like this: By positioning my table/workspace parrallel with my wall of cubes, I feel like I can more easily access my supplies which will make for easier use and returning unused items back to their space. This set up is a lot more functional. Plus, my table is pretty much clear so I can really spread out my projects. January 1 marked the tenth anniversary of Mamma's death. It's been hard for me to celebrate New Year's since she passed away. Ironically, I started scrapbooking after attending a Creative Memories party less than three weeks after she died. Scrapbooking was a great distraction for me during my mourning process and today it continues to be my "escape" when I'm stressed. Mamma's cabinets and counter were donated on New Year's eve. I was able to let them go. In doing so, I've started simplifying my scrap space. I have a few bags of items to donate and giveaway. That's a good start to a new year. Hi Amy! I love your new space! It makes me want to scrap! Maybe I need to revamp my room too! wow - your space look awesome! Way to go! Amy, looking good! I know how hard it is to move on at times after we lose a loved one...praying for you and for joy for you in the New Year and in your new space! Happy creating! Your room looks great!! Very bright! It is so hard to let go of things sometimes but it feels good after! I just got rid of pretty much everything I owned when I moved back home...it was hard! Amy - I love the new scrap space! I have been revamping mine too. I am so happy that you are finally able to move forward and let some things go as hard as that may be. It looks like you are off to a great start!!! 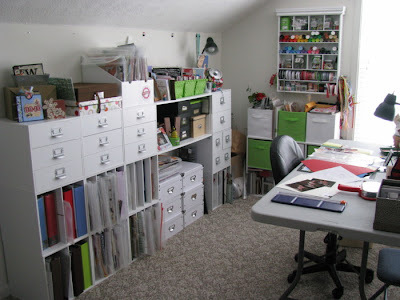 Amy, I love your story of how you came to your current scrap space. I love how you did your cubes and your story really inspired me. Thanks!